The UAE team failed to hold their place in the semi-finals of the 8th edition of the Huawei Championship for the Dubai Intercontinental Beach Soccer Cup, held under the patronage of His Highness Sheikh Hamdan bin Mohammed bin Rashid Al Maktoum, Crown Prince of Dubai and Chairman of Dubai Sports Council. Brazil (9-1). This is the third time in a row that White has played the "beach continents" from the first round, only to play against America on the fifth and sixth places. The national team achieved the best participation in the Confederations Cup in 2012 and 2013, when it came in third place, while the championship version in 2011, 2014 and 2015 in fourth place. 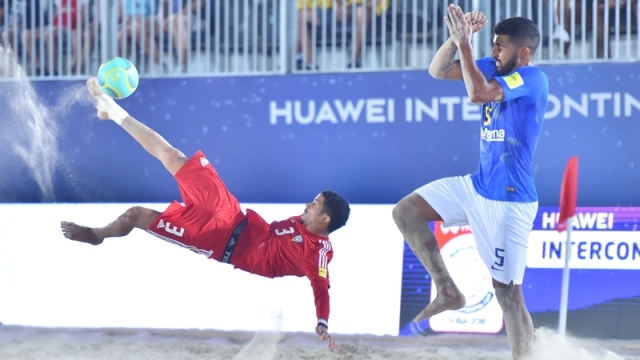 The Egyptian team managed to get the semi-final, along with Brazil, at the expense of the Spanish team, who won 7/6, after a game was «Pharaohs» close to the loss. The team, through Mustafa Ali, managed to score the goal with a shot from a long distance (5), but the Egyptians did not enjoy the goal much, as the Spanish striker Torres Miliano was able to recognize the equalizer from a shot as well (6). The excitement reached its range when the Pharaohs advanced through Mohammed Abdul Nabi from a steady blow, which he executed well into the goal. In the second half, Ahmed Al-Shahat managed to widen the gap by adding the third goal, which raised the objections of the stars of Al-Matador to no avail. But the Spaniards reacted in the same minute with two consecutive goals by Eduardo from the Egyptian goalkeeper's trick, and Torres Miliano through a ball also fooled the keeper, before Salvador Ardele returned to advance the Spaniards for the first time on the score level 4-3. Almadador continued to dominate the match and scored his fifth goal through David Ardele, before Hassan Mohamed reduced the gap to the Egyptian team in just 10 seconds. The Spaniards then returned quickly to the sixth goal, which was signed by Lorenz Gomez. But the Pharaohs managed to score in the last two minutes with three consecutive goals, followed by Mustafa Ali (2 goals) and Ahmed Al Shahat (goal). Russia and Iran were booked in the semi-finals at the expense of Tahiti, who beat the United States yesterday 7/6 after extension to extra time. Mohammed Al Mazmi, the UAE national football team coach, admitted that the team entered the Intercontinental Championship this year in its best technical and physical form, in addition to the previous version. Unfortunately, some of the referees have been denied the semi-finals. "We have prepared ourselves perfectly for the continental championships, whether through the Kuwait camp or the friendly match we played before entering the tournament," he told Emirates Today. It is true that we have not played any official championship this year, but the preparation of the white was qualify to be one of the sides of the Golden Box ». He added: "Our opening loss from Egypt contributed to the complexity of things, especially as our international potential and rankings were the favorites for the win, but unfortunately we were affected by some of the refereeing decisions in that match by not counting two penalties for our benefit. This was not the main reason, but the performance of our players was less than expected. " "In our second encounter against Spain, we proved that we are a good team, despite the strength of the team and their outstanding players, and we gave them a difference of four, before the whistle gave them three steady strikes from close range on goal. "It was not acceptable for us to meet world champion Brazil in the opening, to avoid a big loss that affects the morale of the players and put them under pressure in the rest of the matches. We planned to play gradually with the teams in the group with the UAE, but we were not lucky, Qualification ». Egypt beat Spain 7-6 to take their place in the last four. White paid for the loss in the opening match against the «Pharaohs» to stop competing for honorary positions in the tournament. White for the tournament, he had his best third position twice.